An all star line up of musicians came to town to offer a celebration of and/or tribute to James Brown (May 3, 1933 – December 25, 2006) who was known to all as the Godfather of Soul, while also paying homage to the relationship between Funk, Soul and modern African and Afro Caribbean music. The show started off with a tune called Soul Pride. Pee Wee Ellis, the bandleader and MC for the night, is a living legend. He is described as the man who invented FUNK. 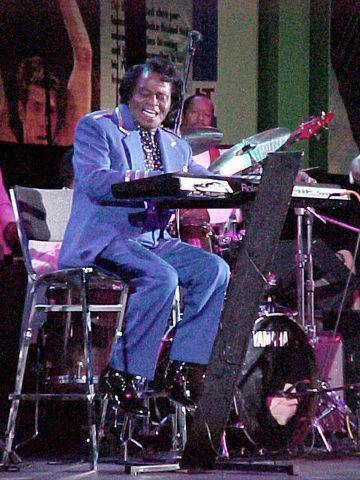 His work with James Brown and others has led to his stellar reputation. He wrote Cold Sweat, arguably the first pure modern funk song, and according to my research, as many as 25 other James Brown songs. The next couple of songs were a little disjointed. The sound was off and it seemed like the musicians were having a hard time finding their rhythm. In a funk show or any other show, this not the way you want to begin. It almost seemed or felt like the band had not played together a lot. Although the band changes members frequently it has been doing this Tribute for quite some time. Many of the band members seemed out of place. The band members were Pee Wee Ellis, band leader and sax, Maceo Parker, sax, Vushi Mahalasela, vocals, Fred Ross, vocals, John Mader, drums, Marc van Waneningen, bass, Ray Obiedo, guitar, Peter Madsen, keyboards, Pap Assane M’Baye, percussion, Chad Berstien, trombone, and Gary Winters, trumpet. Maceo was the first guest performer of the evening. His presence was welcomed and his vibe was, as always, cool. His style and confidence is synonymous with funky music. His pedigree is impeccable. He has played with every leader of the funk movement from James to George Clinton and Bootsy Collins to name a few. He connects the history of funk in one thread. got everyone grooving. Say it Loud was a stand out. It was interesting to get the New England crowd to sing the response I’m Black and I’m Proud. But they did and it worked. The encore of Cold Sweat and Pass the Peas were great. The show ended and everyone felt FUNKY. If you haven’t been to the Mahaiwe since its renovation, please go. It is by far one of the premier venues in the Northeast. Having watched this great theatre go through many changes over the last 20 years, I can say that the current offerings, while quite eclectic, make it a something-for-everyone kind of place. From the Metropolitan Opera in HD to the Mark Morris Dance Troupe to Roseanne Cash, the current management has done an outstanding job of bringing top-notch entertainment to South County. BRAVO!